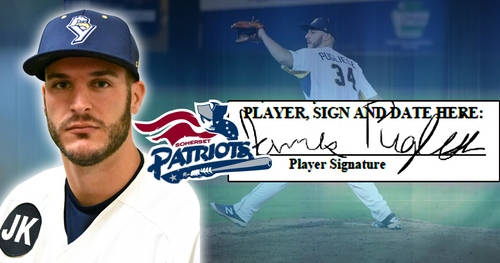 Bridgewater, NJ- The Somerset Patriots have announced the signing of right-handed pitcher James Pugliese for the 2019 season. His rights were acquired in a trade with the York Revolution for the rights to infielder Nate Coronado. 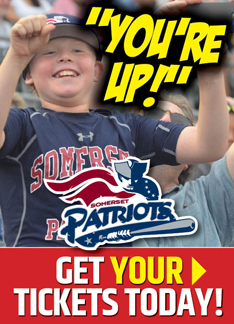 Pugliese enters his first season with the Somerset Patriots and second in the Atlantic League. He joined the Revolution in late June last season and posted a 5-1 record with a 2.29 ERA and 36 strikeouts over 35.1 innings pitched as a reliever. This came after he began the year with Double-A Tennessee in the Chicago Cubs organization, where he struck out five batters over six relief appearances. The Trenton, New Jersey native truly excelled in the second half of the 2018 season. Pugliese only allowed four runs over 28.2 innings of work after the All-Star Break, good for a 1.26 ERA. That included a stretch from August 6th through September 5th where he made 12 consecutive scoreless relief appearances with 17 strikeouts against just three walks. Additionally, the 26 year-old boasted the second-lowest ERA among all Atlantic League pitchers in the month of August (min. 10 appearances) and allowed just one run over his final 16 appearances of the season. Pugliese spent the first seven seasons of his professional career in the Cubs organization, including four separate stints at the Double-A level. He was twice named a Mid-Season All-Star in his time as a Cubs farmhand; once with Low-A Boise in 2013 and a second time with Double-A Tennessee in 2017. That 2017 marked arguably his best in professional baseball, posting a 7-2 record with a 1.84 ERA with one save over 40 appearances (seven starts). The Steinert High School standout played one year of college baseball at Mercer County College. He went 6-1 with a 1.27 ERA and 71 strikeouts over 56.2 innings at MCC before the Cubs selected him in the 18th round of the 2011 MLB Amateur draft. Pugliese owns a 34-25 record with a 3.34 ERA over his eight-year professional career.